Basic campground, beautiful lake, gravel pad, good utilities. There must be a leak with the water, there was a lot of mud and puddles in the grassy area. The pad was a bit short for our 30' motorhome, we had to park at the road edge. The bathrooms need an update and some carpentry work. Otherwise a nice place. Peaceful and quiet. There is a beautiful pond for fishing. We camped at Rippling Waters Church Of God Campground in a Motorhome. The 4 miles of road to get to the campground were hair-raising. Narrow, twisty, curvy, hilly, and the constant threat of oncoming traffic! But once we got there it was great. We were given a pull through site by the pond. There were swans, geese, and ducks. There is a beautiful little chapel on the far shore of the pond. Very picturesque. Full hook-ups, friendly people, a real shang-ri-la. I'd recommend Rippling Waters. We camped at Rippling Waters Church Of God Campground in a Motorhome. As the other reviews have stated, this is an odd campground. While somewhat scenic, it is primarily seasonal or permanent residents and there are only a handful of sites for overnight guests and only 5-6 pull-through sites. Ours was level and the utilities typical. While we had a reservation and called to confirm, our site had just been taken by another guest. The camp manager was able to catch them befor they set up so we could have the last PT as confirmed. There is no AT&T service at the pull-throughs and you must walk up the hill to the lake to get 1 or 2 bars. You are 4 miles or so off the highway and while we weren't concerned about safety, we were happy to drive out of there the next morning. There aren't many choices in the area. Next time we'll probably time out our day to be able stay elsewhere North or South. We camped at Rippling Waters Church Of God Campground in a Motorhome. We stayed one night in a 50 amp full hookup pull-thru site that was long and level. Fresh gravel had just been spread out on our site. Campground has lots of seasonal and permanent residents that had most of the shaded sites. Our site was open to the sky. Utilities are in the middle and water pressure was strong. No dog park but there were plenty of places to walk the dogs. It's dark and quiet at night so we had a great night's sleep. Owners were very helpful and accommodating. Campground is 4 miles off the interstate on narrow, winding country roads, especially when you get on Middle Fork Road, where there are about 3-4 switchbacks with blind curves. Also if you have a big and tall rig, some of the trees have low branches. They're a PA park and also give discounts to military and veterans. We camped at Rippling Waters Church Of God Campground in a Motorhome. As others have said, you have to drive down a winding, narrow country road to get to the campground. The people are friendly and check in was easy. They had someone lead us to our site. All the hookups were easy to locate and close to together. There wasn't any shade at our site, but there are trees close by. We were able to get some TV channels with the antenna, as well as the satellite. AT&T cell service non-existent, AT&T Wi-Fi hot spot was hit or miss, mostly miss, but we were able to get text messages. We camped at Rippling Waters Church Of God Campground in a Motorhome. This is a Passport America park, and the PA book lists it under Kenna, Trailer Life lists it under town of Romance, and my receipt said Kenna. it is about 20 mi north of Charleston WV. Signs of the exit just say Rippling Waters Campground. $30 rate; we paid $15 as PA rate for a nice long FHU 50 A site. It is off of Exit 116 off I-77 about 3 miles down, road into park is blacktop not very side but fine for large RVs. Some are seasonal sites, overnight sites are pull-through. This is a nice quiet, peaceful park, very clean, small lake with some boat rentals, fishing. 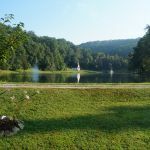 There is a small pond, also pool, laundry, bath houses, some cabins, lodge, conference center with dining hall, gazebo, a small chapel by the lake. They have Sunday services in the chapel and also have weddings there. It would be a perfect place for a fall setting as the fall colors there would be great. Beautiful park. We will definitely stop here again when in the area. Roads into park look like they were recently redone with new blacktop. We camped at Rippling Waters Church Of God Campground in a Motorhome. We stumbled on this excellent campground while traveling through West Virginia. It is about 3 miles off the interstate using exit 116 and the road is narrow and curvy as you would expect in the mountains. The county road splits the park in half but there is not a lot of traffic so not a problem. There isn't much to do here and the place is full of seasonal campers. Shopping is 20-30 minutes away depending on which way you go. There are only a few sites for those traveling. Sites are gravel with plenty pf room between them. FHU utilities are solid. No cable and my guess is no over the air TV but our Tailgater worked fine. We got decent Verizon 4G signal with our Wilson booster. So why do I rate this so high? It is peaceful and quiet. Nestled in the mountains with a beautiful small white church and nice pond complete with Lucy the resident swan and several ducks. Just a great place to kick back and chill and thats what we did for a week. We also lucked out and got a site with the pond and church right out our front door. We loved it and would come back in a heart beat if in the area. We camped at Rippling Waters Church Of God Campground in a Motorhome.